Includes PC1010, 1 Gallon Electric Oil-Less Hand-Carry Compressor - PC1010 Designed especially for finish and trim work as well as a variety of crafts and hobbies, the Senco PC1010 Compressor is a lightweight and ultra-quiet choice. This 1 HP compressor offers high performance in a compact, portable package and provides ample pressure for a wide range of small to medium jobs that require the use of pneumatic tools. Is easily portable at just 20 pounds. Delivers 20 to 44 drives per minute. Offers durability thanks to an aluminum cylinder. The PC1010 is easily transported from site to site. With 1 HP of power, the PC1010 lets you easily install door casings and floor molding. Lightweight and Portable for Easy Maneuverability Weighing in at just 20 pounds, the PC1010 is easy to carry from site to site as you work. And because it measures a compact 12.5 x 10.3 x 14 inches (WxHxD), it's ideal for jobs with limited work space. A cushioned handle grip makes it comfortable to carry and hold, and its compact size also means it won't take up too much room in your shop. Efficient, Mess-Free Operation Capable of delivering 20 to 44 drives per minute, depending on the tool and application, the PC1010 features a direct drive motor/pump that provides extra-efficient operation for a variety of jobs. And the pump is lube-free, which means you won't have to worry about the mess and disposal issues involved with working with oil. An aluminum cylinder offers reliable durability. Versatile Enough for Both Professionals and DIYers With a one-gallon capacity, the PC1010 is ideal for a range of renovation and home improvement jobs, as well as for hobbies and crafts. Additionally, it takes only 128 seconds to pump up and 35 seconds to recover, so you won't waste valuable time waiting to have enough power to complete your jobs. Significantly quieter than pancake compressors, the PC1010 makes very little noise while running, so you won't have to worry about disturbing neighbors or waking napping babies while completing in-house jobs. And its rubber-covered feet won't scratch hardwood floors, so you can feel comfortable using it in your home. About Senco For over 50 years, Senco Products, Inc. Has provided high-quality products to make it easier for both professionals and remodelers to complete a wide variety of renovation, construction, and industry work. Based in Cincinnati, Ohio, with distributors worldwide, Senco is one of the leading manufacturers of pneumatic and powered fastening systems, as well as the fasteners they drive. Their tools boast superior workmanship and are used in a variety of industries, including home construction and remodeling, cabinet and furniture assembly, manufactured housing and industrial packaging. What's in the Box Senco PC1010 Compressor, regulator, pressure gauges, 1/4-inch universal coupler, and air filter. Lightweight and portable--easy to carry from site to site as you work. One horsepower peak , 1/2 horsepower runningand one-gallon capacity. Ideal for a range of renovation and home improvement jobs, as well as for hobbies and crafts. Package Dimensions - H 12.6 inches L 15.35 inches W 13.58 inches. Item Dimensions - H 10 inches L 14 inches W 13 inches. What Our Clients Are Saying About Us. Thank you very much for your effort. You care about your company and me, the customer. PO Boxes - Please include a physical street address. We answer questions promptly and honestly, please feel free to ask. 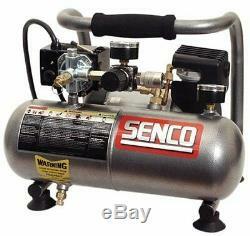 The item "Senco 1 Gallon Air Compressor Portable Home Shop Office Auto Tire Work Garage Pc" is in sale since Saturday, June 22, 2013. This item is in the category "Home & Garden\Tools & Workshop Equipment\Air Tools\Air Compressors". The seller is "newyorq" and is located in United States. This item can be shipped to United States.